Night falls in Granada. Badiaa Lafdaili and Said Jellal leave their bags at the hotel and head out into the Andalusian city to explore. The Moroccan couple has already been in Bin al Mad’in, to give the nearby resort town of Benalmadena its orginal Arab name. “Andalusia is the birthplace of the great Arab poets and artists,” says Lafdaili, herself a teacher of Arab literature. Her husband, a civil servant, says that the only downside to their trip to Spain has been the absence of halal restaurants. Laifdaili and Jellal are typical of a new generation of Muslims from countries with fast-growing economies eager to see the world. Spain is regarded by many as a must-see destination: a bridge between Europe and Islam, and whose history has left many visible traces of its five centuries under Arab rule. “People think that Islamic tourism is half traveling, half praying, but they’re wrong. Muslims want to see the things that interest them, but without sacrificing their religious practices,” says Fazal Barhadeen, who runs CrescentRating, which ranks hotels and restaurants according to their adherence to Islam. Such has been the interest from Muslims that an Islamic version of Trip Advisor is in the pipeline. Spain has tremendous potential as a destination for Muslim travelers, but it also has a long way to go, according to the experts who met recently in Granada at the first Halal World Tourism Congress. Unlike many of its competitors, Spain has very few restaurants or hotels that are certified halal. 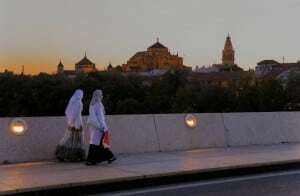 Even so, the number of Muslim visitors to Spain is growing. There was an 85-percent increase in Saudi arrivals in 2013 compared to the previous year (42,000); while the number of Algerian visitors rose by 30 percent for the same period, and 182,000 Turks came here; a 57-percent rise. Still a small percentage of the 60 million visitors overall, and a long way from challenging Germany as a source, but still significant. Delegations from the Middle East and Malaysia are due to visit Andalusia shortly to sound out the market. Muslim tourism is a €1-billion market, according to US consultancy Dinar Standard, and is set to rise to €1.4 billion in 2018. What’s more, Muslim visitors tend to spend well above the €980 that the average tourist leaves behind during a visit to Spain. “This is a crucial moment for Spain if it is to make the most of this opportunity,” says Tariq Mahmood, founder of Andalusian Routes, a Spanish company specializing in Islamic tourism. Mahmood moved to Spain 28 years ago from the United Kingdom after backpacking around the country. He says that when he first saw the Alhambra, in Granada, he realized that this was the ideal place for young people like him: Muslims raised in the West, and for whom their parents’ homes seemed alien; at the same time, he felt a need to get in touch with his Islamic roots. “No country can compete with Spain. There is nothing like the Alhambra or the mosque in Cordoba anywhere else in Europe,” he says, adding that many of his clients are overcome with emotion when they see these two legacies of Spain’s own Islamic past. Rafi-Uddin Shikoh of Dinar Standard agrees: “Spain has to get out there and sell itself to the Muslim world.” Granada’s tourism board recently held a seminar for 120 of Andalusia’s leading hoteliers and restaurateurs on how to get halal certification. Elnur Seyidli is the owner of halalbooking.com, which he set up in 2009, and which now has clients from 73 countries who offer, for example, hotels with women-only beaches in Turkey with bars serving non-alcoholic cocktails. “Muslims prefer to pay more if it means not breaking their religious rules,” he says. But Flora Sáez, who runs Nur y Duha, Spain’s only halal tour operator, says that Spain is catching up fast. “Two years ago, if you called a hotel to ask if they were halal certified, they didn’t know what you were talking about. Today, there is a lot more awareness, and hotels realize this the potential of the Muslim market.” She also points out that Muslims, whose holiday calendar depends on the phases of the moon, offer the potential for year-round visits. In Granada, Francisco Pérez Segoviano, owner of the Al Fresco restaurant, says that attracting Muslim visitors has helped him weather the crisis. Round the corner, workmen are putting the finishing touches to El rey del shawarma, another halal certified eatery, soon to be ready to receive the faithful who have obeyed the Quran’s advice to travel and know the world.